“Atlantic Power Corp. has announced it is idling plants in North Bay, Kapuskasing and Nipigon but will be paid until the end of its contract on Dec. 31, 2017, while Northland Power’s Iroquois Falls facility says it will produce less power until April. 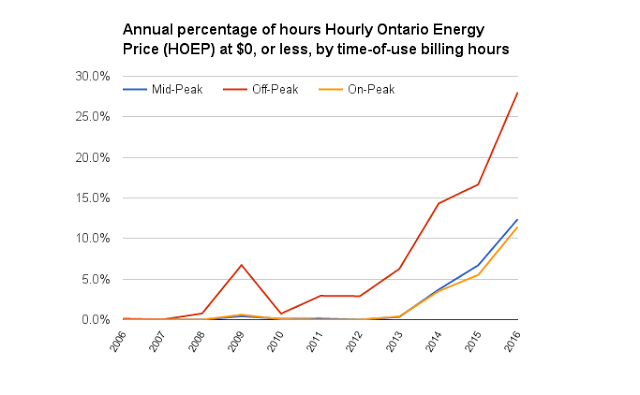 Following a recent post in which I displayed the growth in hours the market failed to produce a positive price for electricity I was advised a much better indication of Ontario having too much committed supply is when the price exceeds the taxes on hydroelectric generators. I’ve since performed some research, and analysis, that do show this is a better methodology for estimating periods of surplus baseload generation (SBG). The Ontario Ministry of Finance shows two charges levied on hydro-electric (hdyro) generators: property taxes and a water rental charge of 9.5% of “a stations’s gross revenue from annual generation”. The property tax escalates with the production level: 2.5% (of revenues) on the first 50 gigawatt-hours (GWh), 4.5% on the next 350 GWh, 6% on the next 300 GWh, and 26.5% on all annual generation above 700 GWh. This makes the top rate 36% (combining water rental and property tax). Here’s the other side of that apparent success story. It’s not as rosy as CanWEA, the wind power industry lobbyist, would like you to believe. During the past decade’s green dumbing down of electricity communication the standard unit of output became the “home”. The unit is derived from dividing the annual output of a generator (usually one with unpredictably sporadic production) by the average annual consumption of a residential consumer. I updated my databases with the latest (2015) US EIA data, grabbed what the IESO admits to importing and exporting, and graphed out Ontario’s net exports to New York and Michigan in the trendy “homes” unit.